I sort of did this the wrong way around - I showed you how to break a bubble-wrap before how to make one within the new paradigm of 6th edition. However, with past posts and knowledge most readers should know the basic premise of bubble-wrap regardless. Showing you how much easier it is to break with just the basic old bubble-wrap concept hopefully highlights how many of the rule changes have affected such tactics. In this post we'll lay out how to get the most out of such concepts and whilst it's still easier to break than before, forcing your opponent to expend more effort to do so. First we'll look at what bubble-wrap actually is. If you know, bugger off down to the next title! Bubble-wrap at it's most basic (and most advanced really...) is a layer of infantry placed in front of other infantry or vehicles meant to take the brunt of assaults on the chin and protect the more valuable or fragile units behind. On top of this, if used correctly it can prevent the use of shorter-ranged weapons on units behind (i.e. the melta-range of meltaguns on vehicles). This is less important now as melta-weapon alpha-strikes are harder to pull off but still an important consideration against short-ranged weapons. The primary goal is to hold up aggressive units, particularly with the increased fragility of vehicles in combat. By engaging enemy units before they reach your lines (or rather, having them engage a unit in front of your lines), your army has more time to manuever, react and shoot down the opponent's army. How models are removed from shooting is a massive kick against bubble-wraps as opposing players have more control over being able to break through bubble-wraps. There are ways around this or to limit this discussed below but for now, it's a weakness. Changes in cover also affect how durable such units are. Cover saves are now applied on a per MODEL basis - no longer can you string large squads out of area terrain and into open terrain whilst still gaining a cover save. Compounding this is focus fire which adds to the opponent having greater control over what models you remove from your bubble-wrap. They are however better in assault, assuming they don't get swept off the table. With pile-in moves only being 3", their effective ability to be dragged laterally away from units they are protecting has been halved. What makes a good bubble-wrap? There are two schools of thought here. One is a cheap yet durable for cost unit and the other is a unit which is just damn scary and durable (i.e. you assault it and will likely lose). Something like Kroot or Imperial Guardsmen who have bonuses when in cover (certain covers for Kroot) and are cheap on a per-model basis or Ork Boyz/Termagants who are Fearless and just dirt cheap (yes Ork Boyz can be brought below Fearless levels). Options like Fearless or Stubborn are excellent as they ensure the units won't fall off the board as often and in combat are impossible or unlikely to be swept, even if they are crappy there. Stealth, Shrouding or abilities which allow units to Go to Ground for extra bonuses are all also excellent options and if they have offensive capacity in the form of shooting or combat, excellent but that role is ALWAYS secondary to their defensive wrapping nature. Otherwise a very durable and scary unit which can both proactively engage the opponent (i.e. gunlines) or defend against a more aggressive army. Durability and combat power is generally the key here with good examples being Nob Bikers (particularly with lots of LoS! options) or Terminators of any ilk. So bubble-wrap has taken a hit, no doubts about it. If the opponent has minimal shooting however, it's still very strong at stopping assaults from reaching your main lines and with new assault rules, they are even less susecptible to being pulled out of the way by assaulting units. A proactive bubble-wrap can even look to engage opponent's before the new shooting rules come into significant play. Beyond this though, one needs to try and counter the 6th edition shooting rules as much as possible to force the opponent to expend more effort to break through the bubble-wrap to the goods behind. The goal here is to make such an effort inefficient where simply engaging the unit in assault and using shooting to engage the units behind the bubble-wrap unit is a better option for the opponent. Ergo, the bubble-wrap has done its job and protected the rest of the army from assaults. There are a couple ways to do this. First, look to terrain. If there are any BLoS terrain pieces you can use this to your own advantage to help protect one flank (remember, I generally play no terrain is impassable). Your opponent can use this as well but since they are trying to break through your unit with shooting, this can be a great boon to you. Remember as well to try and get cover on as many of your models INDIVIDUALLY as you possibly can. It will make the wrap last longer more often than not. As was mentioned in the comments by WestRider as well though, be careful where your models with cover saves and without cover saves are as focus fire gives the opponent another option in being able to choose where your models get removed. From there you have two real options. Use characters and layer up. Layering up is pretty basic. Rather than taking one unit of bubble-wrap and spreading it out in a thin layer where you could pick models off as you saw fit, you make the bubble-wrap thicker and can use more than one squad. The effect here should be obvious. Rather than having to kill only a couple of models (and manuever to only kill a couple of models) for assaulting units to break through bubble-wraps, the opposing player has to kill more models and manuever to kill more models, i.e. expend more effort. This can done with just one unit by generating more depth but less coverage. Conversely, if you have multiple units you can make the bubble-warp deeper and have greater coverage. 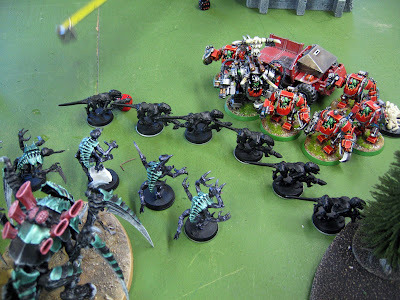 On top of this, more units in the bubble-wrap mean more units are going to be needed to deal with such and the opponent must ensure the holes blasted through each squad line up so an assaulting unit can get through. 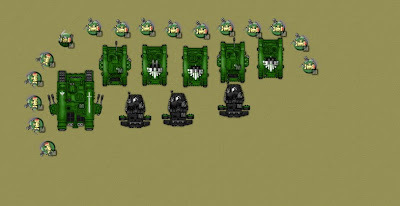 Remember as well, the second unit (or third or fourth, etc.) is more likely to have cover from the initial unit as well. Be very careful of multiple-assaults though. They are harder to pull off but the point of each individual bubble-wrap unit is to delay assaulting armies a full turn. Allowing them to destroy two or three in one combat phase counteracts this. Either way, the point here is to force your opponent to use more units and more firepower than is really necessary to break through such units to get to the protected units behind. If the bubble-wraps are far enough in front as well, assaulting through the bubble-wrap can be an unlikely to succeed prospect due to the new random charge distances. Throw a bit of terrain in there and even 6" is unlikely to be acheived by non-Fleet units. The basics of what a layered bubble-wrap looks like; the Imperial Guard are protecting the Russes from assaults and short-ranged melta weapons. Characters are perhaps the best way to stop bubble-wraps being punched through with shooting but are limited in their own application and not fool-proof. A character at the front of the unit is able to re-distribute wounds through LoS! rolls (to anything within 6" at least) and you essentially have greater control over where you would like models to be removed from. Not as good as 5th edition as it's limited to a 6" bubble and the success of LoS! rolls but better than nothing. For bubble-wraps, this is very, very important as holes are much harder to punch open - you as the controlling player are more capable of distributing them and can thus force the opponent to envelope the entire bubble-wrap to go through any holes which may open up or try to beat it's way through the character's LoS! rolls. Either way, this requires more effort or a reduced effectiveness in assault so the bubble-wrap is working. This does assume a couple of things though. 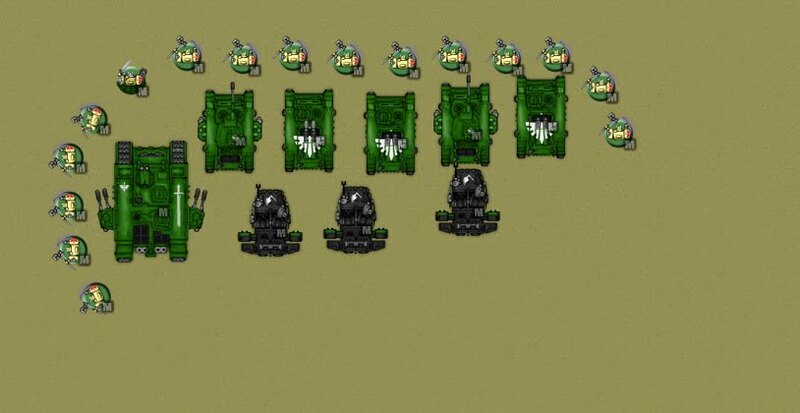 Firstly, the character is the closest model to the firing unit(s) and can thus redistribute wounds through LoS! rolls. This isn't always going to be the case, particularly with flanking units and thus the defending player must identify where the opponent is likely to try and break through the bubble-wrap and send a unit through the hole in the same turn. Put the character there and/or use multiple characters (character units are great here). Beyond that, there are still ways of bypassing the effectiveness of the character through the usual tactics of line of sight blocking or tank shocking to move other models closer. Furthermore, continual application of the character as a bullet catcher is going to see them end up taking some wounds and thus be less efficient elsewhere. Ultimately, bubble-wraps as we knew them are less applicable and effective. It's too easy to break a hole in them during shooting which defeats their purpose of protecting units from assault. The major difference here is not that the unit is easy to shoot away (it is with reduced cover) but specific holes can be shot with a little bit of effort from the opponent to allow a unit through in the same turn. This bypasses the effect of the bubble-wrap. Making this as difficult as possible is now the main goal of bubble-wraps in 6th which if successful, forces the opponent to deal with the bubble-wrap normally (i.e. assault it) or expend so much effort it has become inefficient. In the end they are still a good tactic to attempt to utilise, particularly if you can run multiple layers/thicker wraps or use characters to choose where the wounds land but they are not as fool-proof as they were before.